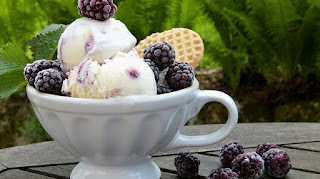 grandma's cookie jar: July is Ice Cream Month! I love the month of July for several reasons . . . .
My husband's birthday is in July! One of my grandson's birthday is in July! It is the middle month of summer and days tend to be warm and sunny. My grandsons are on summer break and I get to see more of them in the month of July than any other month all year long! It is National Ice Cream Month! Yes, these are all wonderful reasons to love the month of July, but it is reason number five which I'm writing about today! It is true, July is Ice Cream Month! Now, I personally am in favor of ice cream being something which we celebrate all year long - every single day, but since July is Ice Cream Month, I'm happy to celebrate it this month! So, how did July become Ice Cream Month? Well, back when Ronald Reagan was president the American Dairy Association had the idea of designating July as Ice Cream Month (no big surprise here) - the president, wisely, agreed and so now we are able to enjoy celebrating the wonderfulness and deliciousness of ice cream all month long! To help us celebrate, I thought I'd share some fun ice cream facts . . . since it would be quite difficult to give you all ice cream! Did you know . . . The worlds tallest scooped ice cream cone was 9 feet tall - people in Italy hold this record. Chocolate syrup is the world's most popular topping for ice cream. Vanilla is the USA's favorite flavor of ice cream. One cow gives enough milk to make two gallons of ice cream a day! It takes three gallons of milk to make one gallon of ice cream. 9% of all the milk produced in the USA is used to make ice cream. It takes approximately 50 licks to finish a single scoop ice cream cone. Brain freeze happens when ice cream touches the roof of your mouth. The first dessert in recorded history which was similar to ice cream was in the 5th century BC - the Greeks combined snow, honey and fruit for a cold dessert. What is your favorite ice cream? I love mint chocolate chip, but also truly enjoy peanutbutter with chocolate peanutbutter cups ice cream!